A well presented three bedroom end of terrace family home, situated in a quiet cul-de-sac location within Ifield. Upon entering the property, you are greeted with the spacious entrance hallway providing plenty of space for shoes and coats. Continuing through, you enter the good sized kitchen which consists of ample of wall and base units with granite worktops providing lots of usable work space. There is also a 4-ring gas hob with a new Samsung integrated gas oven with extractor hood over, built-in washing machine, dishwasher and fridge/freezer and multiple floor to ceiling storage units. Moving on, you are greeted with the large open plan living/dining area comprising of a large bay window keeping the room bright and airy. 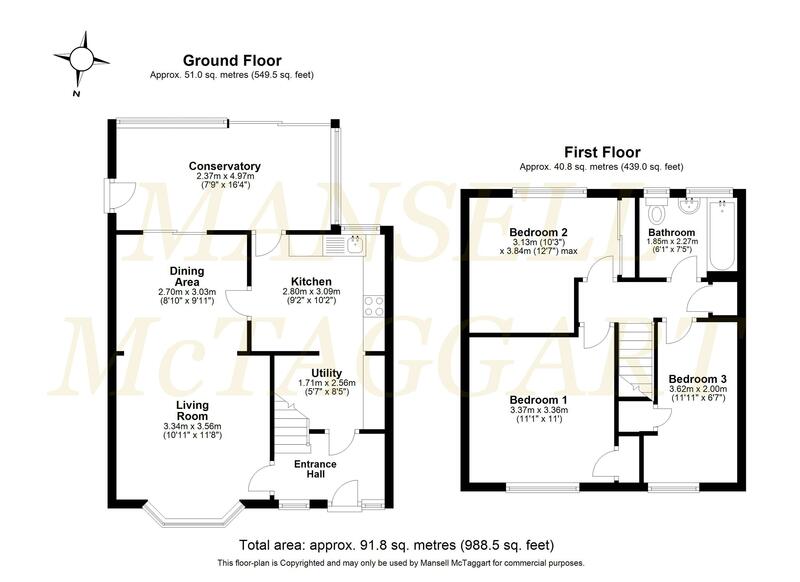 Within the dining area there is space for a large 6+ person dining table with access to the good sized conservatory. In the living area there is space for multiple large family sofas and any other free-standing cabinets you may wish. Heading upstairs, there are three good sized bedrooms and the family bathroom. The master bedroom is a generous size with multiple large built-in storage compartments and a large UPVC window to front. The second bedroom is also of a good size with space for a double bed and contains large built-in storage with sliding doors. The third bedroom is also a decent size with space for a small double bed. There is also some built-in storage and space for any free standing units you may wish. The family bathroom is mainly tiled with a full-length panel bath with power shower overhead, low level WC, wash hand basin, extractor fan and heated towel rail. In the hallway, there is also an airing cupboard and loft access with pull down ladder. To the rear of the property you have the south facing rear garden which is mainly laid to lawn with side access. There is also a small paved area for any garden furniture. To the front, is the driveway with space for one car. A perfect property for first time buyers and those upsizing alike. Internal viewings are highly recommended to avoid disappointment. The property is situated on the western side of Crawley within a short drive of Crawley town centre with its extensive range of shops, recreational facilities and schools. Ifield, Crawley and Three Bridges railway stations with fast and frequent services to London and the South Coast are within easy reach as are Gatwick Airport and the M23. Schools The Mill Primary Academy, St Margarets C of E Primary, Ifield Community College, Holy Trinity School, Gossops Green Community Primary School.